We’d love your help. 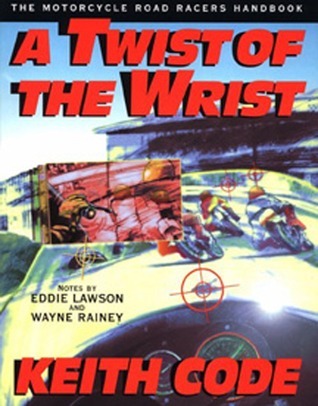 Let us know what’s wrong with this preview of A Twist of the Wrist by Keith Code. To ask other readers questions about A Twist of the Wrist, please sign up. 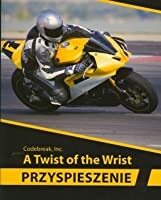 I was recommended this book by a friend before I started to ride motorcycles. He had said reading it changed the way he rode. When I bought my first bike, I decided to read it in hopes of having a good starting point for the base of knowledge. A lot of what it said came across as common sense and directed at racing more so then your average rider. I did find value in the writing, however I didn't see it as a game changer like my friend. For non-racers this book does have some helpful tips. The points about where to look, what countersteering is, and how to brake were all useful. Lots of not so useful material however, too. Probably excellent if you are a racer. Quite a few insights for any rider. Like anything, the theory must be followed through with practice. Helped me as a road rider to consider road positioning, speed and braking. Two pieces of advice for anybody desiring to ride a motorcycle: take a Motorcycle Safety course and read this book. I acquired this book shortly after taking the Motorcycle Safety Program course in Pennsylvania. I wasn't interested in road racing or heading out to a track. I was looking for things that might be useful in gaining better control over my machine. What I found was a witty, entertaining and very helpful book. It has been thirty years since I read it, but that has not diminished the im Two pieces of advice for anybody desiring to ride a motorcycle: take a Motorcycle Safety course and read this book. I acquired this book shortly after taking the Motorcycle Safety Program course in Pennsylvania. I wasn't interested in road racing or heading out to a track. I was looking for things that might be useful in gaining better control over my machine. What I found was a witty, entertaining and very helpful book. It has been thirty years since I read it, but that has not diminished the impact that it made on me. His chapter on Crashing had very useful information, and a catchy subtitle "Relax: Your Just Road Testing Your Leathers". This was the first good information about getting away from the bike I had ever seen or heard. Coupled with his earlier concept of Thinking It Through, it only made sense to get free of the bike so a bad situation doesn't become worse. Having laid a bike down at speed in my younger days, I can attest to the disorientation involved, so his advice about not trying to get up before you are sure you've stopped is very appropriate. All of the basic information about steering, braking, the situational awareness required in riding are explained well. His pivotal chapter about having only so much attention to give to anything contains excellent advice for many situations. If you have to devote too much attention to the dozens of operations involved in operating the machine, that cuts into the attention you can give to what you want to accomplish. In his case, that meant the race, in my case it meant paying more attention to traffic and potential threats to my continued well being. Recommends it for: motorcycle riders. My uncle who taught me to ride told me I had to read this book. I can see why that is too. I may not be into racing, that's why I chose to ride a dual sport instead (plus the roads in my town). Anyways, this book teaches you how to fall when it happens (because everyone is going to fall at one point or another). It teaches you about counter-steering, braking, and so much more. The only thing I wish is that I read this before my motorcycle class. All in all, a good read for beginning riders. The o My uncle who taught me to ride told me I had to read this book. I can see why that is too. I may not be into racing, that's why I chose to ride a dual sport instead (plus the roads in my town). Anyways, this book teaches you how to fall when it happens (because everyone is going to fall at one point or another). It teaches you about counter-steering, braking, and so much more. The only thing I wish is that I read this before my motorcycle class. All in all, a good read for beginning riders. This book was a general introduction to the science and practice of race riding. Primarily forced on how attention is split and the impact of those choices, most of this is basic but necessary, though likely in itself not sufficient. I didn't get as much out of this Volume 1 book as I did from the Vol 2 video. It may be the medium, or may be the content. Next step is to read Vol 2 and see if the content is what resonated. Buku ini memaparkan teknik-teknik riding serta tips-tips racing di jalan raya dan race track - khusus untuk sport bike dan motor balap. Wajib punya bwt yg gila balap motor dan safety riding di jalan raya. Decent into to motorcycle racing (not general riding skills), albeit dated. Doesn't have much technical detail and very high level as compared to, e.g., "Going Faster" (for car racing). Smart guy, weird writing style. Really good book learned an awful lot, great explanation on road cambers, increasing and decreasing radius apex, bankings. Vol II is better and includes everything in this edition.